Remotes are a handy addition to your gas fireplace. The Real Fyre Basic On/Off Remote Control is no exception to that. While it may be a basic on/off receiver/transmitter set, that doesn't make it any less valuable to the Peterson automatic pilot kit models. 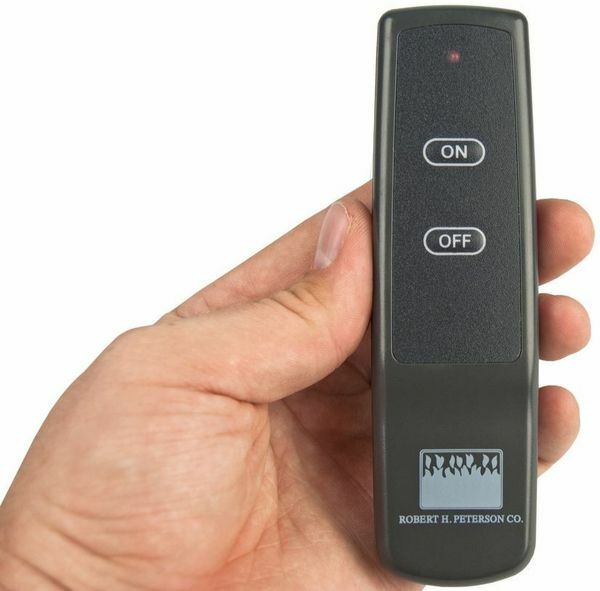 Don't struggle to turn your gas fireplace off and on without this practical remote from Real Fyre. I have 2 fireplaces and 2 remotes. However, when I turn on the fireplace with one remote they both turn on. Both remotes turn on both fireplaces. I would like to know how to keep them separate. One remote per fireplace. I have two of this remote. Thank you. In a situation like yours, there's a fix that will make sure the remotes don't interact with the other's receiver. First, you'll want to take the batteries out of the remote and receiver for both units. Then you'll install the batteries in the the remote and receiver of the first fireplace and pair the two like usual. Then, before you do the same with the other remote/receiver set, you will want to take the batteries out of the receiver for the first one. That way when you pair the second set, there won't be interference. Finally, you'll put the batteries back in the receiver of the first one, pair the remote and receiver, and the two should no longer interfere with each other. Just put in new battery into my sending remote control...Now what do I have to do to get it to work to light my logs...??? Possibly press the reset button with a tip from the ink pen , until unit beeps then wait until the remote control beeps it self !!! You will need to press the "learn" button on the front of the receiver, and then press the on button on the remote when the receiver beeps. If you are not getting a beep from the receiver, you may have to change its batteries as well. Would this remote work as a replacement for my remote/transmitter for my Napoleon GI3016N gas fireplace? A variable flame remote will not work for your unit. I would suggest the RCST Standard Thermostat On/Off Remote Control. Is this a suitable replacement for a SkyTech 1001-A remote unit? This remote would definitely serve as a replacement for the SkyTech 1001-A. What is the difference between a basic remote and deluxe remote? The basic remote will turn the set on and off, while the deluxe remote adds a thermostatic feature, allowing you to program a desired temperature that the lot set will modulate to. Where does the Real Fyre RR1A Receiver Box get installed? The wiring to the RR1A would need to be run to the unit's gas valve, and will sit either next to the log set, or if installed on a gas fireplace, behind the lower access panel next to the valve. How do I sync the remote and the receiver? There is a small, recessed button on the receiver. You will need to use something small like the end of a ball point pen to push in the button and hold it until you hear the receiver beep. You then push any button on the remote itself until you hear a corresponding beep from the remote. The battery receiver for this kit will use 4 AA batteries. The transmitter uses a single 12 volt, model 23A battery, which is about half the size of a AAA battery. Great help on the phone; it shipped quickly and arrived in working condition. Just like you want to expect. Thank you. I needed to replace an earlier remote unit due to water damage. The new unit works well and I am happy to have my fireplace working again. Works great. Easy instructions. Replaced a unit that had remote missing. The RR1A is so simple to use. Take it out of the box add the included batteries, program and your done, all in about 10 minutes. I use this product all the time and it hasn't let me down yet!!! ProsEase of use, good price, always reliable. When my Real Fyre remote's batteries died, and I replaced them it would not work, perhaps because it needed to be reset, but i was unable to find the instructions in my house or on liner. Since my wife was hosting a party, I, in desperation, bought a new remote. it arrive quickly and i installed it and reset it according to the instructions and it works great. I saved the old one though, and the instructions, but haven't had the time to test it to see if it still works. ConsCoiundn't find the instructions on line (although other Fyre product instructions were there.